The 1066 Black Dance Shoe is a popular sandal in our Supadance Latin Collection here at Duo Dance London. An elegant, beautiful open-toe dance shoe in Black Satin. This stunning shoe is perfect for both the Professional and Social dancer and is suitable for Competitions, Medal Tests and Examinations. The 1066 Black Dance Shoe is an open toe sandal with a six strap knotted vamp, two way fastening strap and diamante quick fit buckle. A regular fit with extra cushion and flexible high arch allowing greater freedom of foot movement. The 1066 Black Dance shoe is available in a 2″, 2.5″ or 3″ flare heel and comes in UK Supadance Sizes 2 – 8 including half sizes. Wrap around ankle strap to keep the foot securely in place. 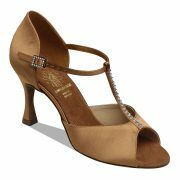 2″, 2.5″ or 3″ Flare Heel.